April 4, 2019 - The digital marketer's #1 daily briefing! Facebook walking like a shrimp where data security is concerned. Taboola rep reveals some insights about native ads. Amazon makes a move towards healthier competition. Putting our eyes inside a big email fraud operation. How Bing wants to take over Google. As you might have noticed, our content is split into a variety of different sections: Facebook, E-commerce, Google, etc. However, it seems like we have reached a point where we could dedicate an entire section to Facebook data breaches. Yes, they happen that often! What happened this time? It turns out that a Mexico City-based digital platform, Cultura Colectiva, openly stored 540M records of Facebook users. This data included identification numbers, comments, reactions and account names. Just a database, you might be thinking. Yes, just a database, but the weird part is that this data was open to download for anyone and everyone on the digital platform. UpGuard, a cybersecurity firm was the first to bring this to public attention. The company discovered something else too: A separate backup from a Facebook-integrated app titled “At the Pool” was also found exposed to the public access via an Amazon S3 bucket. 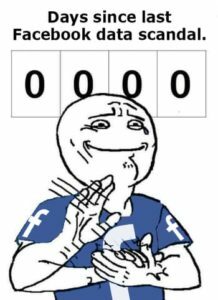 Maybe FB stored their internal poolside stories there? This database contained plaintext passwords of 22K FB users. Jokes apart, this is yet another fail from our favourite social network. Scandals like this happen far too often, and every time we hope the company will solve the issue and get back onto a positive course. Our hopes are continuously dashed though. It looks like FB just can’t stay away from data leaks and breaches. These scandals are probably a result of past mistakes that stem back to before the Cambridge Analytica scandal and the issues that followed. Obviously, FB really has to focus on keeping its public image intact, but as is so often the case they tend to go one step forward (Ad Library) and two steps back. We don’t talk about native advertising in our daily briefings very often, but when we come across the good stuff we make sure not to let it pass by! Mauricio Osorio, an affiliate marketer running native ads, shared some insights from his Taboola rep. If you are buying or looking to buy native ads on Taboola, you might want to have a look at this. Creatives: When adding campaign inventory, aim for at least 5-10 creatives. You can use the same landing page but test 3-5 headlines and thumbnail combinations. Campaign schedule: It allows you to restrict the hours and days on which your ads are visible, making sure that your budget is being used as effectively as possible. Location targeting: Advertisers from different countries bid differently, and to get the most out of your budget you should only be targeting one country at a time. If you want to run to multiple countries, at least club them under similar time zones. Platform targeting: Just like location targeting, each platform bids differently. To get the most out of your budget, you should pick and target each platform individually. Audience targeting: Run your initial ad campaigns to no specific audience. The algorithm will auto-optimize your campaign and provide you data about the audiences engaging with your content. Bidding Structure: Use smart bidding. It automatically adjusts your CPCs on a per impression basis. Pixel: Make sure the Taboola Pixel is placed and that your conversions are defined. It optimizes your campaigns by traffic source, audience etc as the algorithm understands where the conversions or best engagements are coming from. This is some of what the rep talked about, but you can find more on this group post. Plus, Mauricio has shared a CPC Benchmark sent by the rep. However, keep in mind that what reps say isn’t always absolute truth.Whether it’s a FB, Google or Taboola rep, if there is something that works for you but doesn’t go along with what the reps suggest, don’t just blindly follow their advice. Amazon has been repeatedly accused of promoting their own private label products on its platform. A few weeks ago, we reported how Amazon has been aggressively advertising its own private label brands inside other brands buy-boxes. It looks like Amazon has taken note of the backlash that this news received. It has now quietly started to remove obvious promotions, including banner ads, for its private-label products from its search results. The main reasons were the increasing anti-trust concerns from sellers and Democratic presidential candidate Elizabeth Warren. In her announcement, the senator claimed she wants to reduce the economic dominance of online companies that provide marketplaces, exchange or third-party connectivity as “platform utilities” and generate more than $25B in annual revenues. Amazon Marketplace and Basics might be split apart. Acquisitions including Whole Foods and Zappos might be spun out. In fact, Amazon has already discarded its price-parity policy which restricted sellers on its platform from selling the same products on other sites for lower prices. It’s just something more and more people are thinking. Games are part of everyone’s daily life. Yes, we’re talking about video games offers. Come on, if you’re an affiliate, your spidey-senses must have caught that gaming offers are one of the more stable and mature verticals out there. Especially when you have established partners to work with. *drum roll* Introducing Nutaku to all the affiliates out there! They are one of the biggest publishers of more adult-themed video games out there. If you *cough* have a friend *cough* who browses some adult sites, he probably told you about the ads he has seen for them. So that means affiliates are making them work and now you can get the exclusive and direct offer too. Countless video games to choose from, many of them that can be perfectly fine for mainstream traffic too! The affiliate program is managed by AdultForce. That’s the only true source where you can get Nutaku offers. Why would you want to run this? Growing niche – there’s a constant demand for more video games these days, on all devices. Heck, Google also introduced its own cloud gaming service called Stadia! Direct and exclusive – so you’re not getting any rebrokered offers. Accepts global traffic – there are no geo restrictions for players you bring, just quality KPIs. Huge payouts – Get great PPL payouts for worldwide traffic or Lifetime Revshare! Sign up to get your hands on all Nutaku gaming offers at AdultForce! One of our readers alerted us to some suspicious activity going around on FB, so we checked it out and thought we should bring your attention to it too. FB will probably get wise to this soon and shut it down, but in the meantime you should keep your eyes peeled. Don’t give random profiles access to your page, whether their names are Verification Blue Tick, Thanos or Vladimir Putin. While we’re on the topic of fraud schemes, read on to find out exactly how a scam operation works. Last month, a countless number of people fell victim to a huge email fraud campaign. The fraudsters used stolen email addresses and passwords to quietly login to the email accounts and scrape their recently sent emails. They then pushed out personalized emails to the recipients of those emails with a link to a fake site pushing a slimming pill or a bitcoin fraud. But here’s the funny part: The spammer had forgotten to set a password for their own server, and ended up leaking the entire operation themselves! Ironic? Definitely, but this did allow us to understand just how these operations work. Wanna have a look at some of these fraudulent messages, how they target the “prospects” and the ads used to persuade people to take out their CC? Over the last few months, LinkedIn strengthened its targeted options with the launch of new interest targeting options, lookalike audiences and several other data tools. How targeting on LinkedIn works. Ad targeting options available on the platform, how each element works and how you can best utilize them. Custom targeting options with Matched Audiences. Tips to optimize your targeting strategy. Given the various recent additions to LinkedIn’s ad targeting options, this guide is basically an intermediate level course to educate yourself about its various tools and the ways in which they can be used. Whether you’re already using LinkedIn Ads or you’re just thinking about it, this guide definitely worth a read to make sure you’re getting the most out of your LinkedIn ads. Download the full ‘LinkedIn Targeting Playbook‘ guide here. Research and consulting firm WARC recently published their latest Global Ad Trends report. As per the report, the Google and Facebook duopoly is guzzling up more of the advertising market this year, leaving other players battling for an ever smaller slice of the ad pie. Around 56.4% of online ad spends in 2018 went to this duo, and it’s expected to rise even further to 61.4% this year. The duo’s success stems from their dominance on paid search, social ads and the ease of use of the self-serve ad buying tools offered by both companies. Video marketing across the key markets in 2018 was valued at $302B. Majority of this is being on YouTube and Facebook. In the UK, an estimated £1.9B (86%) of online video ad spend went to social platforms last year. While FB launched its Watch platform, positioning it as a safe brand environment for driving meaningful engagements, YouTube experienced some serious issues with brand safety and negative adjacency. However, YouTube is still the dominant player in the market. Google’s dominance in the paid search market may soon come under threat from Amazon. Amazon is developing its own search business, pairing advertisers with consumers close to the point of purchase. 69% of marketers intended to up their ad investment on Amazon this year. Amazon also has a rich database of consumer purchasing habits and has quietly stolen Google’s share in the emerging area of voice search. Its Echo smart device users are well ahead of Google’s Home devices. Even the number of Alexa app skills available are 13x that of Google’s assistant. Younger audiences are leaving Facebook’s core platform for Instagram. 15M US users have quit Facebook in the last 2 years, most leavers aged between 12-34. Instagram saw a net ad budget increase of 67%, ahead of Amazon on 63%, YouTube on 60%, and Facebook on just 13%. Facebook is working on bridging this gap by introducing an encrypted messaging service to regain consumers’ trust and to also build a secure environment for online payments. What can Bing Ads do that Google Ads can’t? Bing answered this question by announcing the global launch of a new ad extension: Action Extensions. It features 70 pre-defined call-to-action options and will be available over both desktop and mobile. You can set a separate URL for an action extension. A maximum of 20 action extensions can be used at any level. You will be able to use them in the web UI, the web bulk account management tool, the Bing Ads campaign management service API and the bulk API. It would be really interesting to see how it impacts CTR and conversion rates. Given the way most of the airlines manage their stuff these days, it’s hard to not feature them in our poolside stories. Whether their intention is to grab some eyeballs by doing those off-beat marketing activities or they just like doing Elon Musky things, we aren’t sure. So, this is what happened on this Lithuania → Italy flight. Crew: 2 pilots & 5 crew members. Lucky fella Skirmantas Strimaitis, was the only passenger on-boarding this flight. 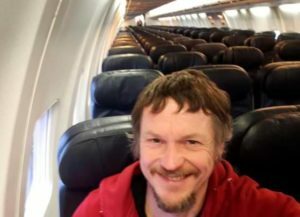 The selfie he shared from the deserted flight has since been doing the rounds on the Internet. Way better than a private jet! Not to mention that it’s a whole lot cheaper!